Restaurant Virginia Beach: Choose FIREBREW! They are good, but we are great. 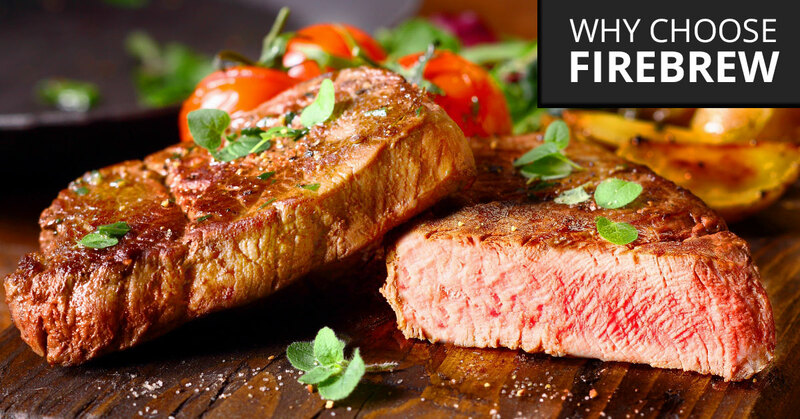 When it comes to food and hospitality, no one does it better than FIREBREW Bar & Grill. We proudly offer the highest quality of food that has been cooked to perfection for your enjoyment. We believe that our hospitality is unparalleled, and you are sure to feel right at home when you stop in today and order one of our incredible dishes. They serve you wine, but we let you serve yourself. That’s right! We were the first restaurant in the Hampton Roads, VA area to offer our guests the opportunity to pour their own wine from our 24-bottle self-service wine station. With that many wines to choose from, there’s no way you can go wrong. We even offer three different sizes of glasses so you can indulge in an old favorite or try several new flavors. Whether you want a “Taste” (1.5 oz), “½ Glass” (3 oz. ), or a “Glass,” you can enjoy your favorite wines and new brands by stopping in tonight and serving yourself! They have an open kitchen in the back, but we have an open kitchen in the center. If you truly want to watch your food being prepared, you can be seated anywhere and enjoy watching our team of chefs prepare your meal. Other restaurants that claim to have an open-concept kitchen usually put their kitchen in the back, meaning that only those who are seated near the rear of the restaurant can truly enjoy the sights. Our kitchen is the focal point of our restaurant, which means that everyone can experience the fun. They use microwaves and fryers, but we use a 600+ degree open flame fire deck oven. When it comes to getting the highest quality of food from our kitchen to your plate, we don’t mess around. To the best of our knowledge, we are the only restaurant in all of the Hampton Roads, VA area to not have any microwaves or fryers in the entirety of our restaurant. So, how do we make your food? We proudly cook everything over our 600+ degree open flame fire deck oven and our grill/oven range. Your food is fresh, carefully cooked, and prepared with attention to every detail that makes a meal truly great. They have beers, but we have even more beers. Sure, you can grab a cold one just about anywhere you go, but how many places serve local brews on tap for your enjoyment? With our beer selection and incredible food, your dining experience will be taken to the next level. Trust our professionals to recommend some of our favorites or pick out an already established favorite of your own. No matter what you choose, your mouth will be satisfied and your thirst will be quenched. They have several locations, but we have the one and only best restaurant in Virginia Beach. Our owners know what it’s like to own a franchise, but they also know what it’s like to turn all of their attention to one wonderful bar and grill. When you come to FIREBREW Bar & Grill, you are eating locally and enjoying the food we have carefully prepared for you. We know you won’t be disappointed in the feeling of community you get when you hang out with us tonight for dinner or happy hour. They make profits, but we make a difference. We support our community and are happy to help in any way we can. That is why we have started the FIREBREW fundraiser program via groupraise.com. This program allows any organization to raise funds through scheduling a date and time when you would like 20 percent of all our sales to be donated to your cause. You bring in your friends and family for some delicious food and help the community and the cause of your choice in the process! When you are deciding where to go for dinner, you may want to consider what we have to offer over the other restaurants in Virginia Beach. We know that we can give you an incredible meal that will make you want to come back every night for such fresh, high-quality food. Contact us today if you have any questions about our menu, our beer selection, or our community service program. We look forward to having you in for dinner tonight! If you can’t make dinner, then no problem – our happy hour specials are perfect for enjoying a cold one before heading home for the day. We will see you soon!